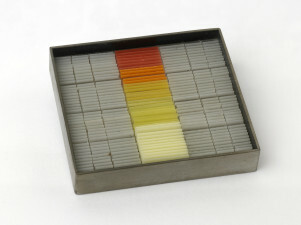 Square metal frame with thin vertical acrylic inserts, predominantly white with two bands of colour: blue, purple, orange and yellow, with a pin clasp on the back. 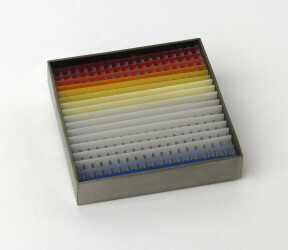 Rhodium-plated base metal box frames with acrylic inserts; white with coloured sections. Lines cut into the surface of the acrylic sheet with a slotting saw. 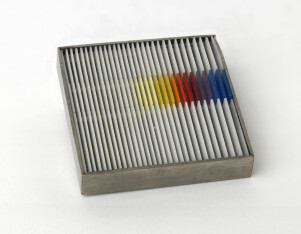 Coloured and white strips of acrylic sliced from sheets and inserted into the slotted lines. 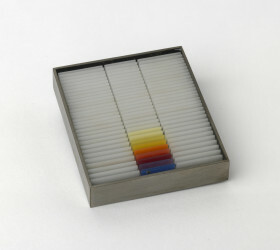 Brooch, Eric Spiller, 1975, Crafts Council Collection: J76. Photo: Todd-White Art Photography. This group of brooches were the first in a development of linear works which explored the visual quality of a three dimensional line in controlled geometrical structues. 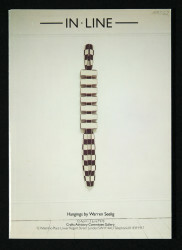 They are the first ideas which formed the 'in line' theme.